Its just less than one week of the public released of Official iOS 6.1 Final IPSW Firmwares for iPhone, iPad & iPod devices, now Apple has just moved further and have started working to build the another beta series of upcoming iOS 6.1.1 Firmwares for iPhone, iPad and iPod devices. 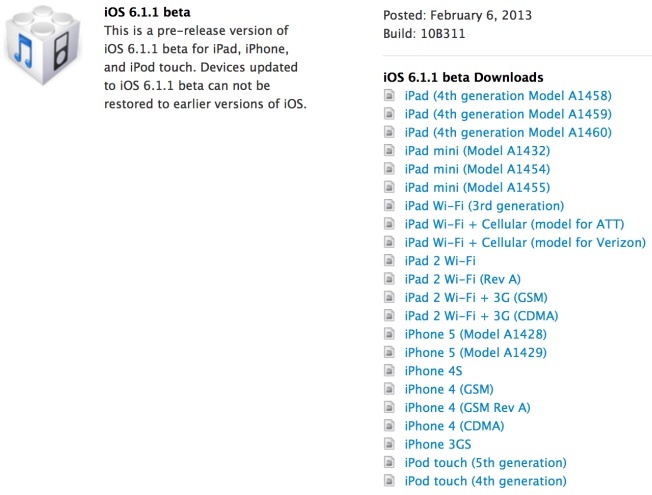 Apple has officially releases iOS 6.1.1 Beta IPSW Firmwares for iPhone 5, iPhone 4S, iPhone 3GS, iPad 4, iPad 3, iPad 2, iPad Mini, iPod 5G Touch and iPod 4G Touch devices for iOS Developers as well for General Public worldwide. The latest iOS 6.1.1 Beta Firmware Update includes some minor software improvements in Apple's iOS Maps and it doesn't contains major software improvements but just a little bit tweaking with "iOS Maps Apps for Japan" because it seems that Apple is now concentrating more towards its iOS Maps Applications and wants to improve it further with iOS Firmware Updates that is why iOS 6.1.1 Beta Firmware also brings some important improvements for the iOS Maps Application so if you don’t have a iOS-Developer’s Account than you can Download Apple iOS 6.1.1 Beta IPSW Firmwares for iPhone 5, iPhone 4S, iPhone 3GS, iPad 4, iPad 3, iPad 2, iPad Mini, iPod 5G Touch and iPod 4G Touch via Direct Links available below. 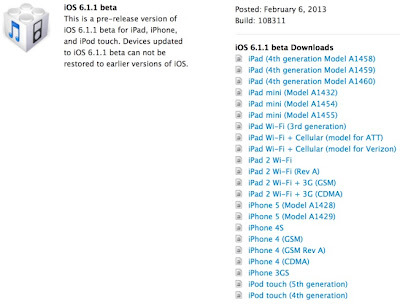 iOS Device users can download iOS 6.1.1 Beta setups files from the following official mirrors. After you get iOS 6.1.1 Beta IPSW files you will need to have a iTunes software in order to Install and Updates your current/old iOS Firmware to the latest iOS 6.1.1 Beta Firmware. According to 'Pod2g' (an iOS-hacker & developer) Apple still doesn't fixed the latest Evasi0n iOS Jailbreak in this update, so users can still use Evasi0n iOS 6.1 Untethered Jailbreak with this update.